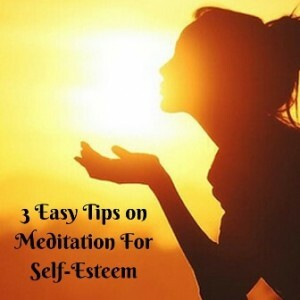 If you’ve ever let what others say to you make you feel lousy about yourself or you often find that you’re sense of inner confidence is lacking, find out how meditation for self-esteem can transform your life. From meditating daily for over 15 years, these self-worth meditation tips will help you gain more confidence and feel more at peace with yourself. What is a Self-Worth Meditation and why should you bother? The simple answer is that there are two specific ways meditation can help you turn a lack of self-worth into a greater sense of confidence and self-assurance. First, it helps you to develop a different relationship with the mind and thoughts so that don’t get so overwhelmed by doubt, fear or anxiety. The result of this being that a greater sense of self-acceptance arises and you start connecting with yourself at a deeper level of trust and calmness. Second, it helps you to find a place of clarity and quiet confidence that you can develop through meditation and then apply to your everyday life. 1. It might be tempting to think that we can somehow get rid of all the negative thoughts that come in our mind whether they are about ourselves or someone else but the reality is that they are a constant stream of mental energy that flows through our mind. If were as easy as replacing them with positive thoughts then many more people would be doing it that way but again this also takes a lot of energy and doesn’t always work. Instead, we need to give ourselves some space from our thoughts so that we can have a bit more clarity and distance from them so we no longer get attached to them as being good or bad, positive or negative, and instead we see them as just thoughts. This helps to diffuse the energy of them and leaves you feeling cool, calm and clear. You may or may not be aware that we have approximately 50 thousand to 60 thousand thoughts a day and for the most they can be labelled as positive or negative. However, when you take the time to sit for a few minutes and just be aware of your thoughts, without having to label them in any way, then this instantly brings a sense of space and calmness. 2. Make it a habit. By taking time-out for five to ten minutes each day to sit or lay down and just ‘watch’ your thoughts your developing a habit of improving your self-worth in two ways. The first way is that you are cultivating a healthy habit for the mind. The second way is that you are giving yourself permission to have a ‘mini-vacation’ from your thoughts each day which gives your mind a rest and helps your body to relax. 3. Respect Your Feelings. While sitting or laying quietly watching your thoughts, you can also practice becoming more aware of any physical sensations in your body as they can give you a clue to any emotions you may be experiencing. Whether your body is restless and needs to move all the time, or you notice aches and pains in the body, they are all signs that you may have some pent up emotions bubbling away in the background. The simplest thing to do when you notice this is to accept them and then bring your focus back to your meditation. By doing this you are acknowledging them, rather than trying to avoid them, or push them down. This simple action can have enormous impact on not only how you feel about yourself, but also on your physical and emotional health. Can you now do a Self-Love Meditation? Keep in mind that improving self-worth is also a natural by-product of some mindful meditation exercises. Feel free to check out my free five minute self-love guided meditation program if you want to experience instant calm, clarity and focus. If you have any questions about my meditation routine, feel free to drop me a line and I will answer you, and if you enjoyed my tips, feel free to share! PS: If You don’t yet Meditate, Find it Hard to Switch Your Mind Off, or Want to Give Yourself a ‘Mini-Vacation’ each day, then This is the Course you Should Start With – Meditation Made Simple in Just 5 Minutes a Day!